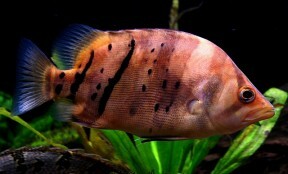 Adult individual displaying slight stress/nocturnal colour pattern. Juvenile displaying stress/nocturnal colour pattern. This species inhabits the highly diverse Danau Sentarum lake system, Borneo. 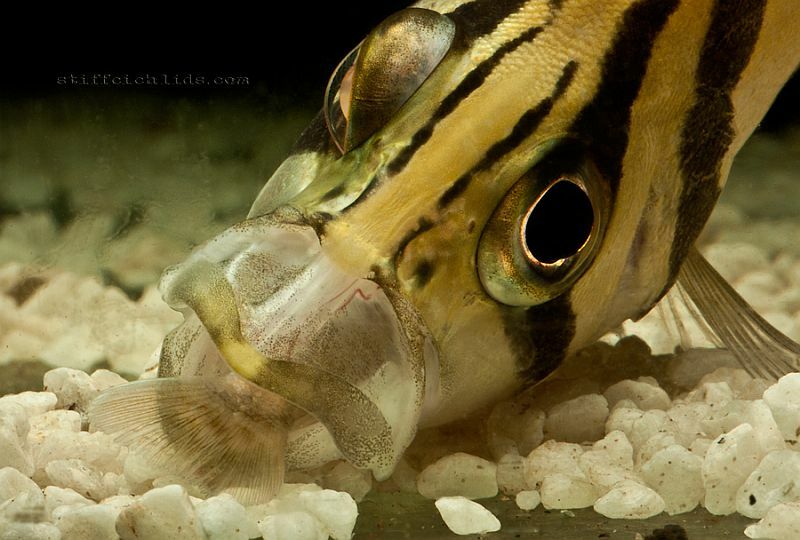 Datnioides species possess protrusible mouthparts enabling them to capture relatively large prey. Young adult displaying stress/nocturnal colour pattern. Juvenile from the Danish aquarium trade displaying stress/nocturnal colour pattern. Head detail of subadult specimen. microlepis: from the Ancient Greek μικρός ‎(mikrós), meaning ‘small’, and λεπίς ‎(lepís), meaning ‘scale’. Apparently restricted to the Malay Peninsula and western Indonesia, where it is known from the Perak and Selangor river systems in Peninsular Malaysia, Batang Hari and Musi watersheds in Sumatra, and Kapuas basin in Kalimantan (Indonesian Borneo). It is unclear whether its range extends into peninsular Thailand, while records from the Chao Phraya and Mekong river basins refer to the congener D. pulcher. 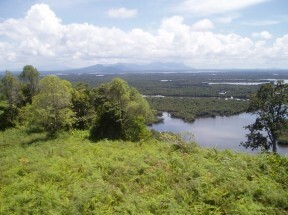 Type locality is ‘Kapuas River, Pontianak, Borneo, Indonesia’. They do not travel well and can be tricky to stabilise post-import, often refusing to feed and continuously exhibiting a colour pattern indicative of stress but also displayed at night. In D. microlepis the dark body bars fade, leaving only the margins or a series of spots distinctly visible, with the majority of the body greyish, brownish, or blackish. Unrecorded in captivity. Observations by local fishermen in the Kapuas River suggest it to be non-migratory, spawning in April and May, with no parental care. In aquarium literature this species is also referred to as ‘fine scaled tiger fish’, ‘Indonesian tiger fish (or ‘IT’)’, ‘Sumatran tiger fish’, ‘Indo datnoid’, ‘Indo dat’, and ‘false Siamese tiger fish’. 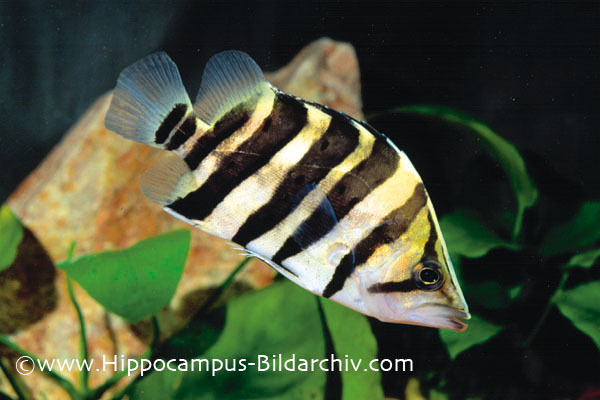 The common name of ‘tiger fish’ is also used in reference to the African alestid genus Hydrocynus, therefore the more appropriate ‘tiger perch’ was suggested by Roberts and Kottelat (1994). 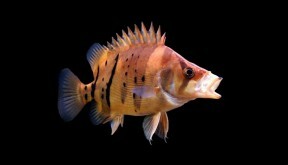 D. microlepis is distinguished from all congeners by the following combination of characters: presence of 6-7 wide dark bars on the body, the first of which usually continues uninterrupted across the opercle, onto the thoracic region, and across the ventral surface of the body (vs. 4-5 wide bars in D. pulcher; 4-6 wide bars with diffuse margins in D. campbelli; up to 7 bars, sometimes with 1-4 smaller bars between in D. polota; 4 relatively thinner bars, first bar sometimes not continuous on operculum, not usually extending onto thoracic region or ventral surface of body, sometimes a single, additional partial bar in D. undecimradiatus); a distinct black marking immediately anterior to the pelvic-fin base (vs. no such marking in D. undecimradiatus); body scales small, with 70-100 in the lateral series (vs. large, 40-60 in the lateral series in D. polota and D. campbelli); predorsal profile almost straight (vs. distinctly concave in D. polota and D. campbelli). 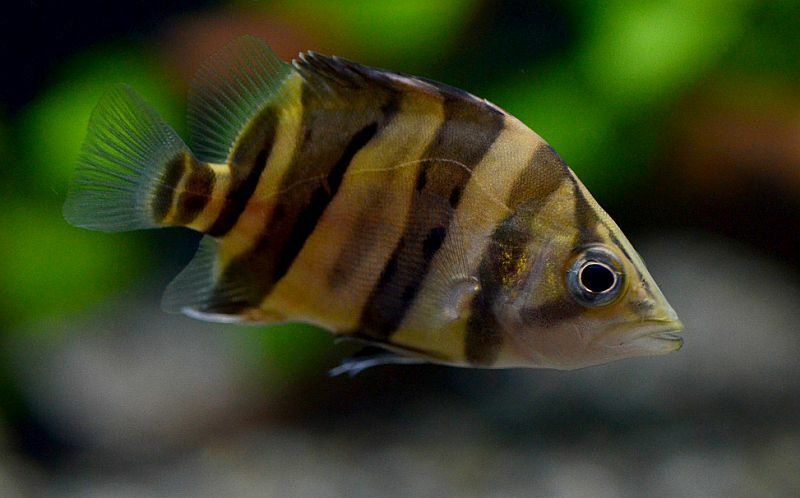 There are additional differences in colour pattern and meristic characters, and in practice it is difficult to confuse D. microlepis with any species other than D. pulcher, these two having been considered conspecific prior to 1998. In principle they can be separated by the number of dark body bars, but this observation appears to be based solely on specimens from Borneo with the colour pattern of Sumatran and Malaysian populations undocumented. 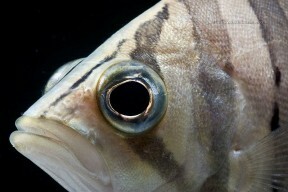 Adult individuals can usually be separated on the basis of base body colour, which tends towards orangey-brown in D. pulcher, dirty yellowish-grey in D. microlepis. 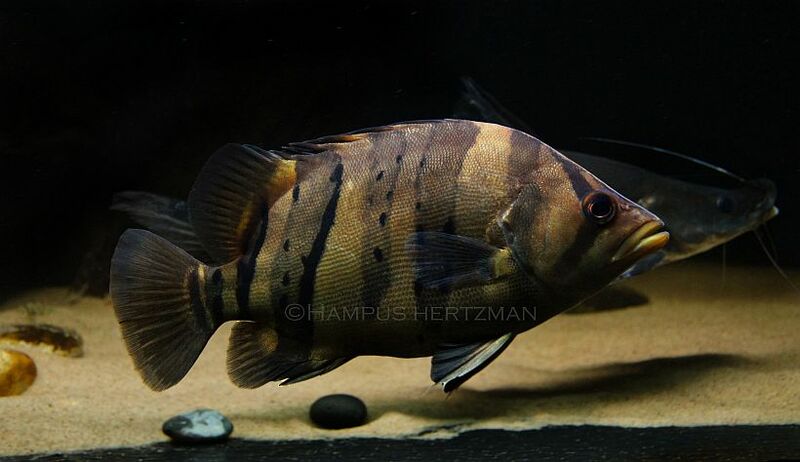 In the ornamental trade D. microlepis is the most widely available tiger perch and is sometimes sold as D. pulcher in order to raise prices, since the latter is considered critically endangered in the wild and may already be extirpated from Thailand. Both species are also fished for human consumption. 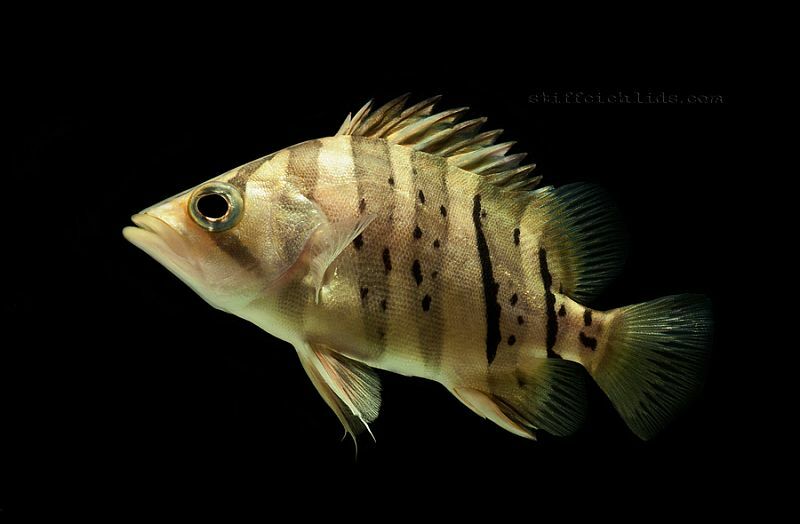 Zevende bijdrage tot de kennis der ichthyologische fauna van Borneo. Zoetwatervisschen van Sambas, Pontianak en Pangaron. 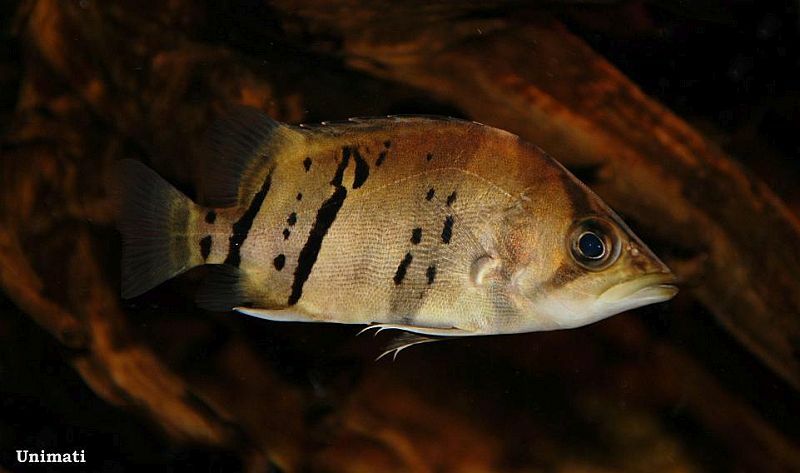 Fish Checklist of Perak River, Malaysia.